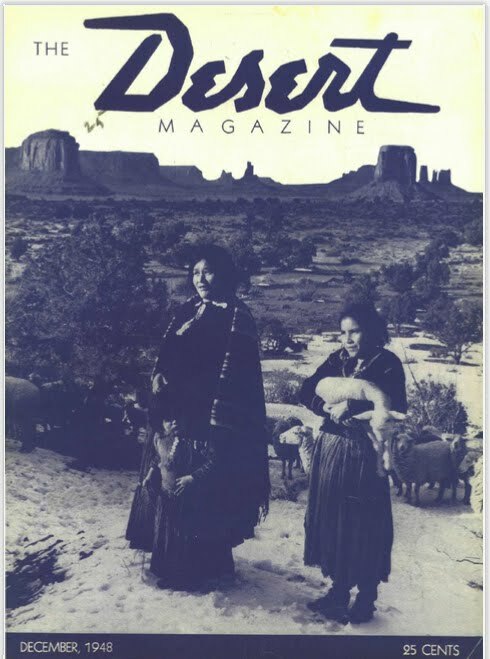 In December 1948, Cherokee fashion designer Lloyd Kiva New was featured in The Desert Magazine (read the entire issue here). In an article, author Christine MacKenzie described his studio, and noted Kiva to be one of the premiere artists operating in Scottsdale at this time. His section of the issue is informative and rather well-written (considering that this was the 1940s). However, when this article was published, other articles were published in the same issue about Native people - highlighting current Indian realities, racism, and public perceptions of Native people. For example, in the ‘Desert News’ section, a short paragraph described how two Seri Indian brothers “received their first taste of civilization” when they were brought from their homeland by an ethnographer to visit Tucson for a week. The brothers were introduced to mattresses, milk shakes, and church organs, of which they called masheen – the author translated this Seri word to mean wonderful, beautiful, good, and fine (The Desert Magazine 1948: 32). The article demonstrated how the American public in 1948 held on to the naïve noble savage stereotype, and held this stereotype to be true. In another article, Interior Secretary Julius Albert Krug was quoted as stating, “The Navajo are not starving. There are too many Navajo on the reservations. We must train them for and get them to take jobs off the reservations” (The Desert Magazine 1948: 32). The destructive policy of relocation was being formed and promoted. 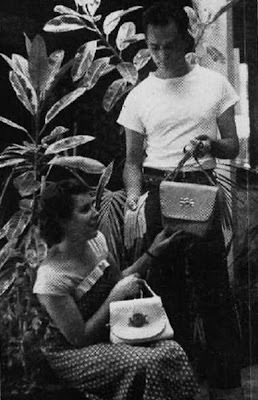 Lloyd Kiva New is pictured below displaying his purses and gloves with his then-wife Betty. He is not described in degrading terms. He is not stereotyped as a romanticized naïve Indian. He is celebrated as a modern, intelligent, creative Cherokee artist and fashion designer. The fact that his business was so successful during this important time - when the government was poised to begin their relocation and termination policies - is an indication of New's hard work, perseverance, talent, and ability to create work that celebrated Native cultures, yet also transcended the boundaries of Native American art. Note: The above material includes copyrighted excerpts from my dissertation, Native Designers of High Fashion.